This chapter is entirely devoted to the flanged Ogee cup. 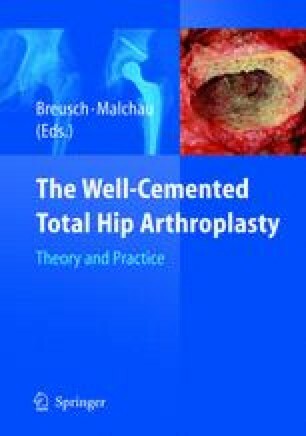 Initially, it presents evaluation of a cohort of 268 Ogee cups inserted by a single surgeon in a continuous series of primary Charnley low-friction arthroplasties. Clinically at 20 years, the revision rate for aseptic loosening of the Ogee cup was 2% a probability of 96.8% survival. Radiological evaluation at 13 years showed 89% of cups to have perfect bonding at the bone cement interface. The X-rays at 20 years are still being evaluated, but data suggests the excellent radiological bonding is being preserved. p ]Explanation of the design emphasises that the flange of the Ogee cup has two main functions. It assists pressurisation of the cement and stabilises the cup against the bony rim of the acetabulum. From the clinical and radiological evidence available, the use of the flanged Ogee cup is assisting sound bonding between cup and host bone in the acetabulum.